Kailyn runs Abracadabra, a shop she inherited from her mother and grandmother, who still show up occasionally to offer advice, welcome or not. Her slightly scatterbrained Aunt Tilly has the shop next door. When the two of them go to the lawyer’s office to take care of some paperwork, they find him dead on the floor. Now, not only does Kailyn have to worry about the two of them being seen as suspects, the lawyer also happened to be her best friends husband. With Aunt Tilly and a black cat as backup, Kailyn decides to find out who really killed Jim Hastings. This is a fun cozy, full of unique and interesting characters, humor, and just enough magic. I can’t wait for book #2! Interesting review. Do love the cover too. 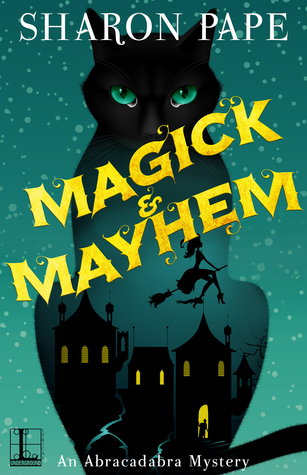 Thank you for hosting Sharon Pape’s book Magic and Mayhem on your blog. Since I am owned by a black cat, the cover drew me in. Magic and Mayhem has been added to my list of books I need to read. The cover really grabbed my attention too – hope you enjoy the book! New author and series to me. Really enjoyed the description of the book and I’m looking forward to reading the book..